hmm looks delicious 🙂 i love taro root usually our favorite is raita..
Oh wow …lovely looking hot steaming sambar girl. I love Taro root. We call it Kesavina gadde. But I hardly find any fresh ones here. Frozen don’t taste half as good as the fresh ones. But beggars cannot be choosers right? Lovely recipe buddy. Thanks Asha, Is this the same Asha (FH) ? Thanks Roopa, I never tried raita with taro root. Dear Seema, Chinese n Korean stores carry taro root. I buy my vegetables from Korean market. If you have one near to ur place you can try there. Lucky me I always get fresh one’s:). hey, liked this new variation on arbi a lot, looks so delicious. Hi Shivapriya, looks very healthy! Thanks Richa, give it a try. the color of that pulusu drives me crazy. the picture is very nice and tempting. true color of pulusu. I am not seeing you posting very frequently. Hope every one is doing well now. You have been Tagged for a meme by me! !..go through my tag post,when you have time :)!! No probs suma. Everyone is fine now. Thanks Bharaty, Hope ur sis is doing well now. Thanks for tagging me, will do it sometime. I hope that’s fine:). Good Luck Sandeepa, Make sure to get tender drumsticks, also lots of tomatoes for gravy as drumsticks absorb all the juices. ma amma chjesedi ilage.Looking so delicious!!! by the way i have tried your tomato maggiga pulusu and noolkol perugu curry..they are too good.thanks for sharing. I did hear for a lot of my friends that Korean stores carry a lot of indian veggies. I don’t think I am lucky enough to have a korean stores close to my place. Will try to find it in Asian market. Hope you had a lovely weekend. gravy type of food with taro root is new to me. I usually make fries with this vegetable. Looks very nice . Thanks Swapna, I’m sure ur mom’s tastes much delicious than mine. I’m really glad that u enjoyed majjaga pulusu and noolkol curry. Seema even chinese stores carry taro root and I have seen them in safeway (american store). We went to NY for my cousin’s grad party , met all my family. I had great time. 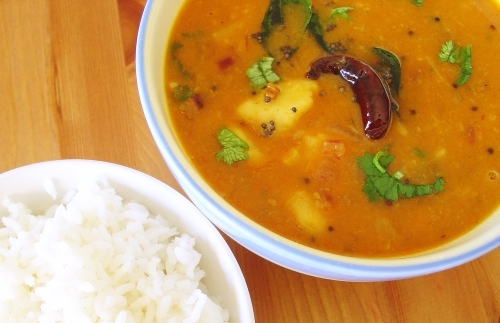 Prema, this is a typical andhra dish, there are couple of more dishes with taro root, will post it sometime. EVen we make fry with taro root and fav way to eat it with ghee rice:). That’s a nice way of using taro root.Very nice pic ! You dint take up my tag? its OK..!! By the way,A pleasant surprise is awaiting you in my JFI-post.Pick them up when time permits:)! !